1 : 3192 This is a 19th-Century copy of a 1614 survey found in the records relating to the Grosvenor Estate. 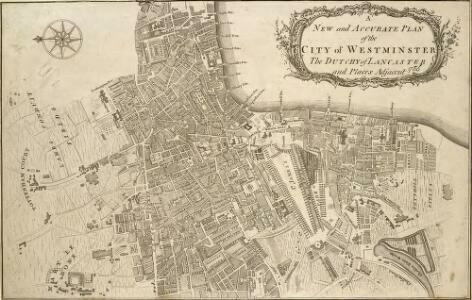 The plan shows the low-lying canals running from Oxford Street to the River Thames that were later used to operate the Chelsea Waterworks. Saunders, G.
1 : 2400 Different pastel colours describe the Parish divisions within St. Giles in the Fields and St. George's, Bloomsbury. A plan of the Burial Ground and Chapel of St. Giles in the Field, adjoining the church yard of St Pancreas, is located in a separate border. Montagu House was sold in 1755 to house the British museum. It was demolished to make way for Smirke''s building in the 1840''s. Hewitt, N.R. A sketch of individuals and their order in the coronation procession is featured at the top of the page.60 years as king, George III's was the second longest reign in British history. He was third Hanoverian monarch, but the first to be born in England and use English as his first language. His reign was curtailed by periodic bouts of mental instability,which many contemporary commentators ascribed to the strain of the American conflict,but was more likely caused by the hereditary physical disorder called porphyria. He was a cultured monarch who donated to the nation a royal collection of books as the nucleus of a national library, now held in the King's Tower;in the British Library. Plan of the parishes of St Margaret's, outlined in blue line, and St James', delineated in pink, Westminster. A thin red line shows the boundary of the Tothill Fields District. The large 6-petal structure depicted at lower left is Millbank Penitentiary, built in response to requests for prison reform and finally completed in 1821. Taylor, J. H.
Description: The title of this map appears in cartouche at top right, with a compass rose at top left. A territory with its own courts and administration, the Duchy of Lancaster was created in 1267 by Edward III for his younger son John. The Duchy was attached to the Crown when Prince Henry of Bolingbroke, the last Duke of Lancaster, became Henry IV in 1399. To this day, the Duchy has retained its own jurisdiction under the Chancellor of the Duchy of Lancaster.The chancellorship is a high governmental position, and sometimes a cabinet poist. Since, for at least the last two centuries, the Chancellor rarely has had any significant duties pertaining to the Duchy's management, he is usually available as a minister without portfolio. Recent Chancellors have included Labour cabinet minister Mo Mowlam.